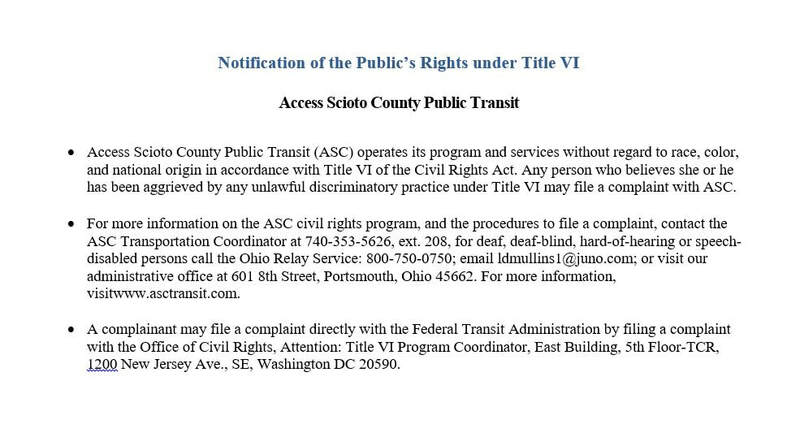 Access Scioto County Public Transit (ASC) is committed to a policy of non-discrimination in the conduct of its business, including its Title VI responsibilities and to the delivery of equitable and accessible transportation services. Any person who believes that he or she has been subjected to discrimination under Title VI on the basis of race, color or national origin may file a Title VI complaint with ASC within 180 days of from the date of the alleged discrimination. There are several ways to file a complaint.